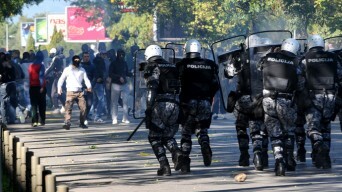 Montenegro hosted its first LGBT Pride on October 20 in the city’s capital of Podgorica, but the event ended with tear gas, arrests and an estimated 60 people injured. Anti-LGBT extremists made their way past the nearly 2,000 police officers present and proceeded to throw rocks and firebombs. Posted October 22nd, 2013 & filed under News.